Polly was unraced due to an injury that occurred as a 2 yr old in training, he might have recovered from that but then Bad luck dealt him a career ending injury. He is a beautiful mover with nice size and balance. 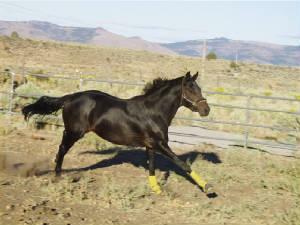 Polly is throwing some super nice foals on quarter horse mares and has colored foals on paint mares as well. 1024x1024-625470.gif Bertrando 1993 eclipse award winner for Champion Older Male with earnings of over 3 million dollars he has went on to prove himself in the breeding barn as well. 2005 leading California sire with worldwide earnings of nearly 4 million dollars and the only California bred stallion to have California bred pogeny earnings and northern hemisphere earnings surpass 3 million dollars. 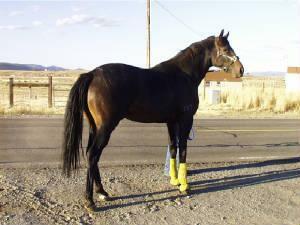 2006 update Bertrando appears to be an excellent broodmare sire and is currently the #1 Miler Broodmare sire in Cal. by Sire Production Index. He's a little upside down at 1.55 AEI VS 1.75 CI, but has consistently gotten quality runners including the #2 leading 1st Crop Sire in N.A., "Officer". GOLD ALERT (1983). Stakes winner of $291,939, Eclipse S. [G3], etc. Sire of 13 crops of racing age, 327 foals, 263 starters, 12 stakes winners, 222 winners of 969 races and earning $13,460,360/$217,023 (CAN) in N.A./U.S., including champions Jed Forest (Premio Presidente de la Republica, etc. ), Still Alert, and of U Can Do It ($738,642, Shirley Jones H. [G3], etc. ), Mil Kilates (10 wins, $630,098, in N.A./U.S., Pimlico Distaff H. [G3], etc.). Sire of dam of champion Durango 1st dam Miss Gold Peace, by Gold Alert. 8 wins, 2 to 5, $181,349, 2nd Grecian Flight S. (MED, $6,650), 3rd Personal Ensign S. [L] (MTH, $5,500), Tropical Park Oaks [L] (CRC, $5,500). 2nd dam PEACEFUL RIVER, by Peaceful Tom. 14 wins, 3 to 6, $250,990, Canterbury Mile H. [L], Quivira H.-L, Apple Valley H. [O], Harvest H., 2nd Ak-Sar-Ben Queen's H.-G3, Quivira H.-L, Al Swihart Memorial H., Spring H., Harvest H. [N], Warren G. Albert H. [N], 3rd Goldenrod S. [O]. Dam of-- Miss Gold Peace (f. by Gold Alert). Stakes-placed winner, above. Peaceful Terms. Winner at 3, $6,302. Full of Peace. Winner at 4, $4,600. 3rd dam RUSH RIVER, by *Sir Ribot. Winner at 2, $4,628. Dam of 7 winners-- PEACEFUL RIVER. Stakes winner, above. Scarlet River. Winner at 3 and 4, $20,669, 2nd KTA Derby [NR]. Tarush. 6 wins at 4 and 5, $13,142. June Rush. Winner at 4, $11,781. Producer. Sir Magestic. Winner at 4, $4,265. Sir River. Winner at 4 and 5. Bold Rush. Winner at 3. Producer. 4th dam Miss Thing, by *Sea Charger. 4 wins in 8 starts at 2, 2nd Maryland Futurity, Pimlico Breeders' S. Dam of 6 foals, all winners, including-- Ivy Hill. 4 wins at 4 and 6, $15,315. Dam of 9 foals, all winners, including-- WHAT A MICHAEL. 9 wins, 2 to 5, $152,468, Southern Maryland H.-L, E. Palmer Heagerty S.-R, 2nd Maryland Futurity-R, Senatorial S.-R, 3rd Star de Naskra H.-R, Lansdale G. Sasscer S.-R. Dashing Dennis. 3 wins at 2 and 3, $67,610. Another Michael. Winner at 2 and 3, $61,760. Steel 'n Velvet. 11 wins, 3 to 5, $59,900. Dam of Frankies Magic (3rd Oklahoma Thoroughbred Futurity Final [NR]).